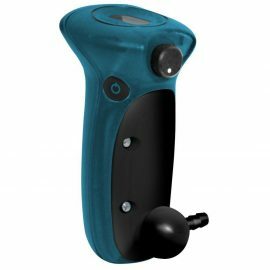 We heard they wanted a durable, compact oxygen analyzer with a user replaceable sensor, readily available batteries, a splash-proof case and and at a reasonable price. 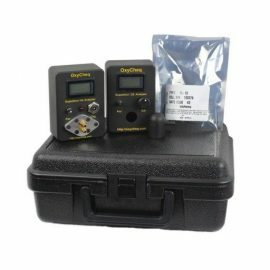 The OxyCheq Expedition Oxygen Analyzer meets this criteria and more. We designed an electronic circuit that is easy to calibrate and uses a long life sensor. We used most reliable parts made and enclosed the electronics and sensor in a compact, sturdy, custom molded ABS case. The case, digital panel meter, potentiometer, on/off switch, and sensor, are sealed to protect the electronics inside the enclosure from harsh elements. It is splash-proof. The “Expedition” comes with a compact carrying case with foam to protect your investment. It also has room for other items such as the optional remote flow restrictor, batteries, or a sensor. Both enriched air divers and technical divers will truly appreciate the compact size, durability, performance, ease of operation, reliability and sensor life. 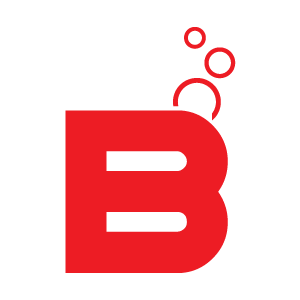 The Expedition set the standard in performance, price and quality for oxygen analyzers for the diving community. The OxyCheq Expedition Oxygen Analyzer uses a removable cap with a built-in flow restrictor. Although not necessary, you can also attach a 2-3 lpm flow restrictor to the sensor cap/flow restrictor if desired. Calibration can be made in air or pure oxygen and takes seconds. Once the sensor is calibrated, analyzing gas is easy. The user simply opens the cylinder valve until a slow, constant hiss is heard, places the sensor cap restrictor over the gas, and waits for a constant reading. The case and cap are extremely durable and there are no pliable rings to wear out or parts to break off. 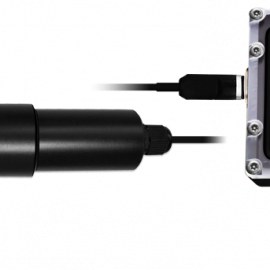 The sensor cap/restrictor also has the ability to sense gas remotely with an optional flow restrictor that can connect to a low pressure bc hose. Changing the sensor or batteries is very easy. When you remove the back of our case, all of the electronics are located on the front half of the case. There are no wires attaching the back to the front that can result in strains on the leads when replacing the sensor or batteries. In limited light conditions and if desired, the user can flip on the backlight. The “Expedition” was built to last and perform … and it does. We did not take short cuts or use inferior parts to lower the quality of this unit, we simply took less profit. 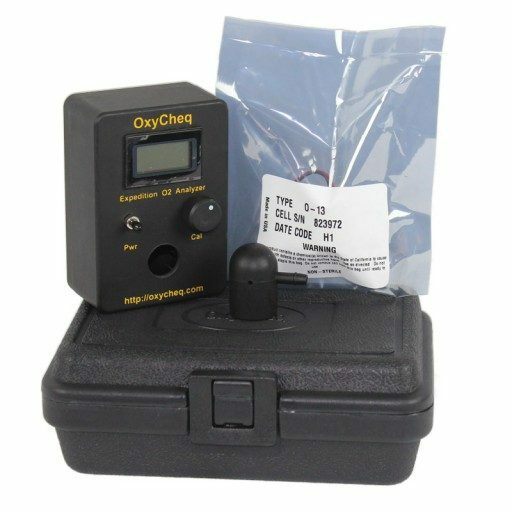 OxyCheq is known for our personal service and attention, we built the “Expedition” for you and have no doubt you will be extremely pleased with your purchase of this oxygen analyzer. Flow restrictors are shown for illustration purposes only. Sensors are a consumable item and may not be returned except under the warranty replacement guidelines. Galvanic sensors contained properties of a battery and should be disposed of according to your local battery disposal regulations. Sensors are consumable items. We cannot provide credit if incorrect orders have been placed. This has no affect on the warranty. 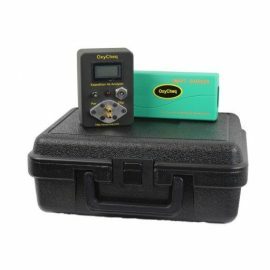 The OxyCheq Expedition Helium Flow Through Analyzer is small, very portable, very accurate and extremely easy to use.